My slow stitch dragon morphed, as creative projects sometimes do, to form powerful symbology for my studio as I embellished it. This ancient animal symbol presents itself as relevant, beautiful and meaningful in today’s world. With its foot raised in mid-stride, the dragon seems poised to step into a sea of opportunity. I think of it as playing full out, and consider the waves underneath its feet as energy. It’s magical, really. This playful dragon will live over the door in my studio, providing both inspiration and demonstration: its purposeful stride reminds me to walk my path with intention. A green snake at the bottom of the dragon represents creative life force. Green is the color of life, renewal, nature and energy. The flames from its mouth are studded with Swarovski crystals. Each flame represents truth, a reminder to speak my authentic truth as I go through life. The idea of slow stitch is one I regularly pursue for relaxation, especially if I am on the road. 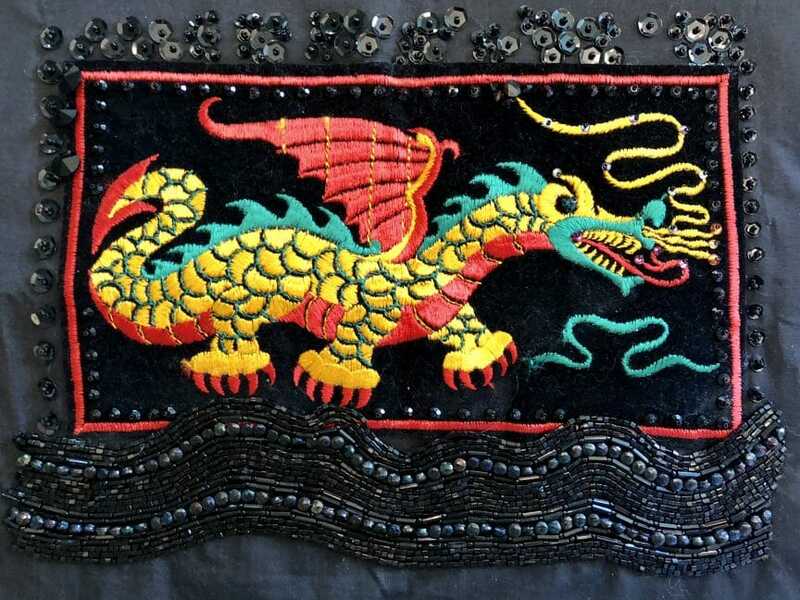 I found myself using large and small black sequins, black railheads, bugle beads, and three-cut beads and other black embellishments, not for any particular symbology, but because of the subtleness black-on-black creates in design. Subtleness is not the way of the dragon, however. Much as been written about dragons and the reappearance of dragons in stories at this time. One such post characterizes “an exhilarating awakening of sooo many sleeping dragons in sooo many wise, fierce women around so many important heated topics in so many parts of the world.” Read more here from Loraine Van Tuyl. In an earlier post I offered another view of dragons in my work. My interest in symbology causes me to explore the meaning of each part of my slow stitch dragon project. The dragon will be stretched over a canvas frame. This will show the slow stitching embellishments in full detail. The magic of this symbol will only grow. It reminds me to take confident steps on my path, make strong connections, and live my life full of truth, light, caring, joy and boldness. I’m excited about the dragon. Do you have a symbol that inspires you?